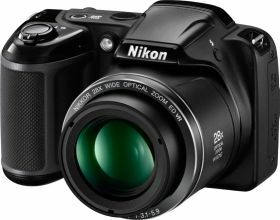 Nikon created the Coolpix series of cameras as one that focuses on point and shoot functions to make it easier for people to take great shots. The Coolpix L340 is one of the newest options in this great line. The L340 camera is designed as a simple option designed for all those who only want something appealing and easy to take pictures with. The Coolpix L340 camera has a basic design that isn’t too hard to use. Even with this simplicity in mind, it still packs a massive punch. It can especially take pictures for a while with batteries that could be recharged depending on what the person uses. 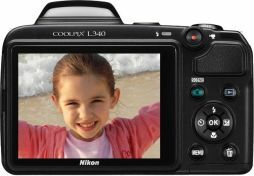 The sensor on the Nikon Coolpix L340 is a 20.2-megapixel CCD sensor that focuses on HD photos. It can also take 720p videos. The sensor works with a 28x optical zoom features and a 56x dynamic zoom feature to move into the deepest details in a scene. It works with a NIKKOR glass telephoto lens to create a clear image that resists dust and can quickly identify the scene in an area. The ergonomic carbon fiber grip on the Coolpix L340 works quite well. It features a great arrangement that allows the user to keep a stable grip that is easy to carry around and use. The added grip on the right-hand side of the camera especially allows the user to keep a good hold on the camera so it will not be much of a challenge to use. It works with a body that is 3.3 inches deep, thus making for a thin design that looks its best. It is also 430g in weight so it will not be far too heavy or difficult for anyone to use. It is specially organized with a setup that isn’t too complicated for anyone to take a look at and should review appropriately and efficiently. The simplicity of the Coolpix L340 is a great selling point for this camera. It offers a design with a series of basic buttons that focus more on pointing and shooting. It allows the user to take a good shot quickly. The controls are primarily made with different controls that are primarily adjusted through the screen on the back. It uses a shooting setup that works with up to four shots at a time with about one frame per second. It uses spot, center-weighted and matrix metering options and six different white balance settings with the option to take in an automatic choice. The shutter may also be adjusted from one second to 1/1500 of a second. This camera works well enough to generate only the best possible images. Thanks to the appealing three-inch screen on the back that offers a five-level brightness setup. It offers about 99 percent coverage around the space to make it easier for the user to see what one is taking a picture of. It is a popular feature that can be useful if managed well enough. It all works with an SD, SDHC or SDXC memory card. This establishes a more powerful file formatting setup that allows the user to save a large variety of pictures. It can handle thousands of pictures at a time although the user will have to take the card out of the camera to look at the images after they are taken. The 4mm lens is an especially critical part of the camera. This wider lens creates a better-performing shot. The 20.2-megapixel sensor is a key part of what makes the Coolpix L340 work well. This camera especially has a great zoom feature that works with a 56x dynamic zoom that works well with the sensor. The Vibration Reduction feature is a key part of the Coolpix L340 to look at. This keeps the photos sharp and stunning as physical movements are kept under control. It, in turn establishes a better appearance when used properly. This feature allows the camera to keep it working quite well but at the same time, there is a need to be cautious as there are no image stabilization points. The Reduction vibration feature will work best when the camera is still on a tripod or other supportive surface. The camera uses four AA-size batteries. It can work with four EN-MH2 rechargeable batteries so the user will not have to replace the batteries all the time. These rechargeable batteries are sold separately. It is best for users to use AA lithium batteries regardless of whether or not they are rechargeable. These batteries will get the user about 960 shots before they have to be replaced or switched out. Four AA alkaline batteries will offer enough energy for 370 shots. The camera is amazingly easy to use without being overly complicated. This is a thin and lightweight camera that is easy to carry around. This can work with rechargeable batteries if the user prefers. They will get the user to work with hundreds of shots before the batteries have to be replaced. The exposure time is rather quick and easy to set up based on the user’s preference. The control mechanisms don’t offer as much customization as what people can get off of a DSLR camera. There are no image stabilization features in the camera. This makes it vulnerable to blurring effects. The ISO 1600 light sensitivity feature isn’t all that strong. The zooming feature, while it can be detailed, can cause the camera to become shaky. 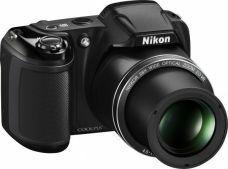 Anyone looking for a point and shoot camera that is simple and easy to follow with should see how well the Nikon Coolpix L340 camera works. It is a basic option that isn’t too complicated and will give off plenty of support. It offers a strong setup that won’t be too complicated.